Part 2 of the Timeline of Eldrick ‘Tiger’ Woods is continued here in this article. The Tiger Woods Timeline is presented in two parts. This is Part 2 of the timeline for years 2002 to 2012. Click here for Part 1. 2004: After a rather prestigious winning streak, Tiger’s career goes onto slump after not winning a major at all throughout 2003 and 2004; the situation being highlighted after being overtaken in the rankings by Vijay Singh which breaks his record streak of 264 weeks at the top. 2005: After the two year ‘slump’, Tiger returns to his winning ways after winning the Buick Invitational, the Ford Championship at Dural and the 2005 Masters Tournament. 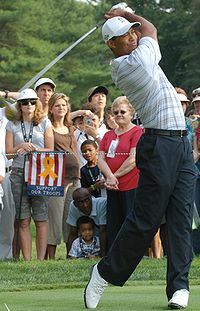 Throughout the course of 2005, he interchanges with the number one spot a series of times up until around July when he wins the 2005 Open Championship; his 10th major. 2006: In contrast, 2006 is a year of internal turmoil after the death of his father and teacher, Earl Woods, who dies at the age of 74 after a suffering from long-term prostate cancer. Woods then takes a nine week break to be with his family during this time and returns to the field for the U.S Open wherein he misses the cut at Winged Foot. After tying second at the Western Open merely three weeks later, a return to form is mooted amongst the greens and is proven true when Tiger finishes with a par of -18 at the 2006 Open Championship. 2008: Tiger’s form continues to excel up until the spring of 2008 when he has to undergo knee surgery which means that he misses the first two months of the 2008 PGA Tour. After winning two major tournaments during the summer, he then undergoes further knee surgery which means that he has to miss the remainder of the season. Due his absence, television ratings during the 2008 season begin to decline. 2009: Woods returns to much anticipation and performs very well despite failing to win a major competition; his first year to do so since his dry spell in 2004. During the fall of 2009, his marital infidelities come to the attention of the media wherein he announces an indefinite break from professional golf. The media attention mars his otherwise spotless reputation as a professional golfer and results in the separation of his long time wife, Elin Nordegren. After a report by UC Davis, a study finds that between $5 and $12 billion is lost in shares thanks to the fallout of the infidelity scandal. 2010: Woods returns to golf in April for the 2010 Masters Tournament where he is able to tie for fourth place. The rest of the season is a bleak run for Woods wherein he fails to win a single event for the first time since becoming professional; he nevertheless manages to finish the season ranked #2. 2011: This form continues to dog Woods throughout 2011 whereby August he finds himself ranked 58th and manages to finish the year a little more than eight places higher. 2012: At the time of writing (May 2012), Woods finds himself 7th in the world after having a much improved golfing year after winning the Arnold Palmer Invitational and finishing tied second place in The Honda Classic tournament. After such an amazing career (that is still yet to finish), it is without doubt that there are quite a few fun facts and figures surrounding the man and it would be a shame to miss them off of any list. Whilst attending his first Masters dinner, Tiger is said to have consumed a total of 9 cheeseburgers whilst at the event. Tiger has a total of four red Nike polo shirts and has won a total of 47 competitions wearing only one of them. It is said that his alarm clock is set to 5am every single morning. Although this may seem a tad early, it makes sense when you consider that his favorite day consists of surfing, golfing, spear fishing and skiing. Tiger’s average club speed is 125 mph, far beating that of the average person which is 31 mph less. This entry was posted in Golf and tagged 2005 Masters Tournament, 2005 Open Championship, 2006 Open Championship, 2008 PGA Tour, 2010 Masters Tournament, Arnold Palmer, Eldrick Woods, golf, PGA Tour, professional golfers, sports, Sports Archives, The Masters Tournament, tiger returns, Tiger Woods, Tiger Woods Biography, tiger woods timeline, Timeline, U.S Open, Vijay Singh. Bookmark the permalink.